When neurologist Renu Pokharna, MD, and her husband, Kishor, fled New Orleans after Hurricane Katrina in 2005, they had lost everything. To make matters worse, they were suddenly confronted with the added crisis of Kishor's renal failure and an urgent need for a kidney transplant. Their two children, Pooja and Rahul, aged 11 and 9, faced multiple challenges including relocating, starting a new school, and their father's serious illness. As chronicled in the December 2005 Neurology Today (“A Neurologist and Her Family Find Friends Waiting to be Met,” page 4) the Pokharna family's fate was forever changed by a small community in Pennsylvania. A chance meeting at a Rotary Club, only days after Katrina, led to offers of a temporary home, medical care, and new clothes from strangers who welcomed the Pokharnas into their lives. The Sewickley Academy gave the children a one-year scholarship, and the University of Pittsburgh Medical Center (UPMC) accepted Renu as a neurology resident, helping Kishor to undergo his much needed kidney transplant in April of 2006. While psychologists warned both parents and educators that Katrina's kids may experience disaster trauma — post-traumatic stress, depression, and anxiety — the Pokharna children thrived. They have not only adjusted to their new home, but have excelled academically. This past April, Pooja, now in sixth grade, was awarded a National Science award and her Science Olympian team won first place in Pennsylvania. Rahul, a fourth grader, was acknowledged for reading the most books in the entire Sewickley lower school. He likes all genres of books but prefers adventures and mysteries; The Chronicles of Narnia and Eragon rank as favorites. When Neurology Today spoke to Kishor recently, he said that he had just begun to return to work in tax accounting and jewelry businesses. Dr. Rokharn is now completing her fellowship in multiple sclerosis and white matter disorders at UPMC, where she will begin working as an assistant professor of neurology this July. 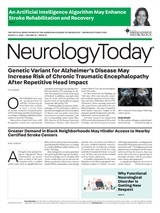 Neurology Today7(12):13, June 19, 2007.